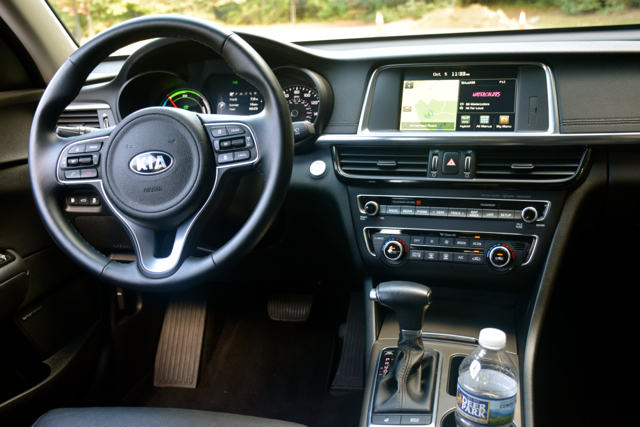 Many miles and smiles with Kia’s Optima Hybrid sedan. The Kia Optima Hybrid is available in Premium and EX trims. Hybrid sales peaked in 2013 and have fallen steadily since. Low fuel prices are a significant contributor, falling below $2 per gallon at times with those low prices covering large swathes of America. Another reason is the advent of modern electric cars — some shoppers are opting for pure electric vehicles over hybrids. Though demand has fallen, manufacturers continue to offer hybrids, which help them achieve EPA fleet averages. Although prices are somewhat higher than their standard gasoline counterparts, incentives typically are strong. Shop carefully and you may find a hybrid costing just hundreds more, while returning excellent fuel economy. The 2017 Kia Optima Hybrid is one model among many in the segment. 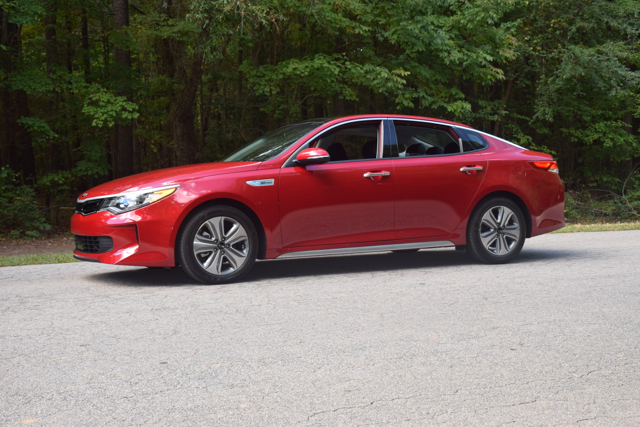 With a base price of $25,995, plus destination, the Optima Hybrid costs $3,495 more than the base Optima S. A second trim, EX, costs $4,995 more than the base hybrid model. For most weeks I drive a manufacturer’s vehicle for six or seven days and for approximately 250 miles. 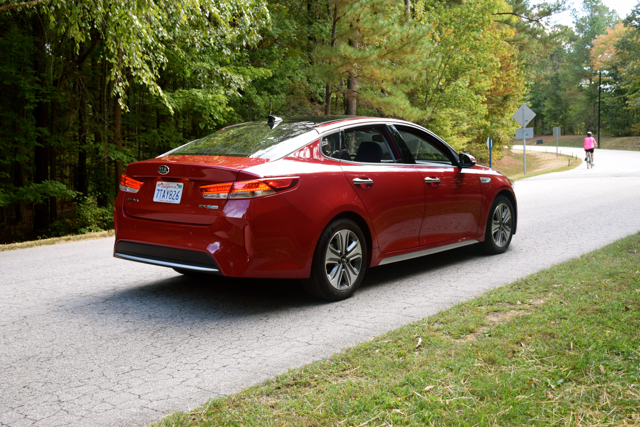 For the Optima Hybrid, we covered more than 800 miles and had the sedan for two weeks. 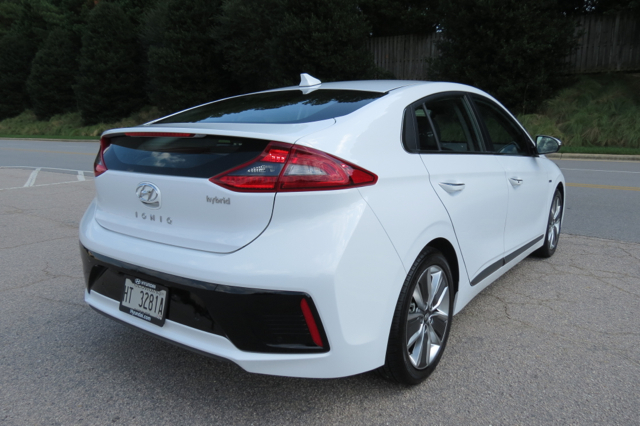 That’s because Kia allowed me to take the hybrid to the 2017 WAPA Rally on Kent Island, Maryland, where my driver partner (Arsis Fruritch) and I drove 10 of the 55 vehicles available. Thank you, Kia! Point No. 1 — The styling differences are negligible. Put gas and hybrid variants of the same model together and the differences are usually clear. For some mysterious reason, certain automakers think customers want to scream “this is a hybrid,” when blending in is the best approach from a styling point in my opinion. Happily, Kia doesn’t make the Optima and Optima Hybrid look much different, other than slight grille differences and badging. What may look avant-garde initially can come across detestable a few years later. I’m not mentioning names, just pointing out the obvious. Point No. 2 — You’ll find ample room for five. Nearly across the board, today’s midsize models are roomy, offering almost as much space as large sedans. The upsizing we have seen over the past five to 10 years takes an opposite approach from the downsizing of the late 1970s to mid-1980s. The winner here is the customer who may want no compromise room for five. Midsize sedans are today’s family vehicle or at least the type of car families want when an SUV or a minivan is not an option. Point No. 3 — The base model is relatively well equipped. 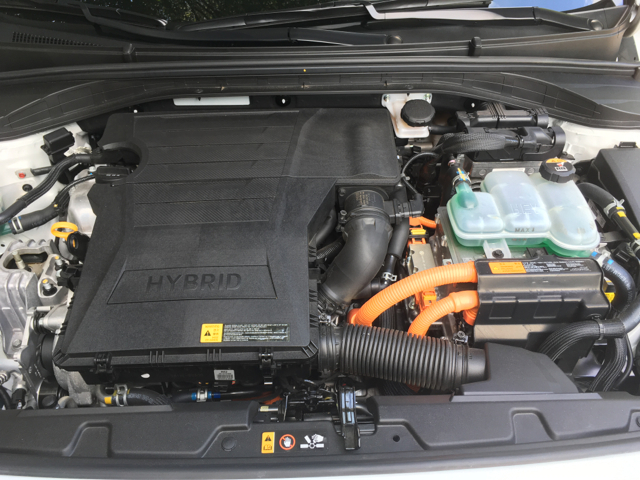 Compare the base hybrid to the standard gasoline version and you’ll find equipment differences, what demonstrates the hybrid is better equipped, effectively narrowing the $3,495 price difference between the two. Furthermore, those differences include the following equipment included with the hybrid, but not standard with the base gas model. With this in mind, I did the research for you. Here goes: heated outside mirrors with LED turn signal indicators, automatic trunk opener, a 7-inch display screen (it measures 5 inches in the gas model), Android Auto and Apple CarPlay compatibility, spill-resistant cloth seats, and an illuminated glove box. That’s quite a number of features you won’t find in the standard model unless you opt for the EX trim, costing just $555 less than the Optima Hybrid Premium. If you want driver-assist features, consider the one package available — the Hybrid Convenience Package ($1,795) adding rear parking assist, blind-spot detection, rear cross traffic alert along with a power driver’s seat with lumbar support, power-folding side mirrors, a driver’s seat integrated memory system, and sound-absorbing front windows. Point No. 4 — The EX edition offers many premium features. As well equipped as the Premium edition is, the EX lifts the equipment offerings to the next level. Indeed, for about five grand you expect a long list of additional standard amenities and the EX delivers. LED positioning lights, power-folding side mirrors, and 17-inch alloy wheels get things started. You’ll also find an 8-inch touchscreen display, satellite radio, HD Radio, navigation, rear console USB ports and a 12-volt outlet, electronic parking brake, mood lighting, front seatback pockets, leather seats, a 12-way power seat with lumbar support, heated front seats, a heated steering wheel, and a split fold-down rear seat. For another $5,000 you might consider the Hybrid EX Technology Package ($5,000), what adds such features as a panoramic sunroof with a power sunshade, ventilated front seats, and heated rear seats. You also get Kia’s full suite of driver-assist features as rear parking assist, blind-spot detection, rear cross-traffic alert, advanced smart cruise control, and autonomous emergency braking. Add it all up and your price tops $37,000 if you also opt for one of two exterior color choices adding $395 to your cost. Point No. 5 — Kia’s technology is not difficult to comprehend….or embrace. Kudos to Kia for making a telematics system that is fairly easy to use. The UVO system is a Microsoft product, but far better than what some competitors offered early on (Ford SYNC, for example). The navigation system worked fine, but I prefer using my iPhone, as Apple CarPlay is my preferred method for obtaining directions. Likewise, Android Auto is also included, giving the majority of smartphone users compatibility they crave. As for the Harman/Kardon QuantumLogic Premium Surround Sound with ClarifFi (standard in the EX), this 630-watt, 10-speaker unit delivers excellent sound. I like what automakers have done in the sound department over the past few years, by offering top-shelf audio systems on top-trim models. Point No. 6 — Safety is hardly an afterthought. The Insurance Institute for Highway Safety (IIHS) awarded the 2017 Optima with its highest crash-testing rating — Top Safety Pick+. This score applies to the hybrid and underscores the attention to safety taken by Kia. 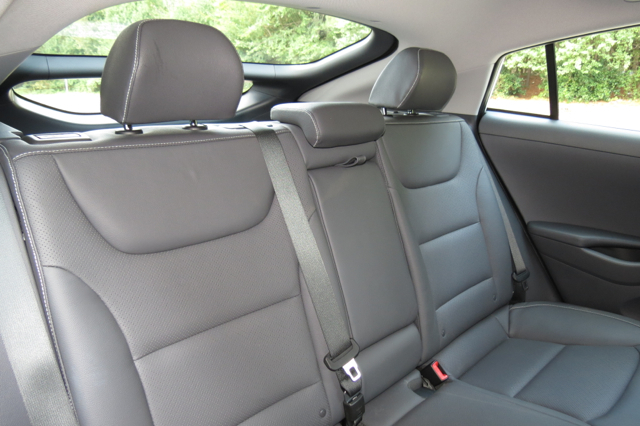 Both trims come with a full suite of airbags, including a driver’s knee airbag. Check out point no. 4 for the various driver-assist features available as they will match what equipment today’s models offer. Point No. 7 — You have the upper hand when negotiating. Rarely do I discuss incentives when reviewing a vehicle. The reason? They change so often. It is always my hope that my reviews will supply value years later too…why add new car incentives when they no longer apply? In fact, there are incentives on new cars — on hybrids, they’re typically the best you’ll find. When buying a new hybrid, you should have more leverage than the standard version, so keep this in mind. Either way, expect deals that exceed the average new car, using those incentives to your advantage. Point No. 8 — There are two kinds of performance attributes to consider. 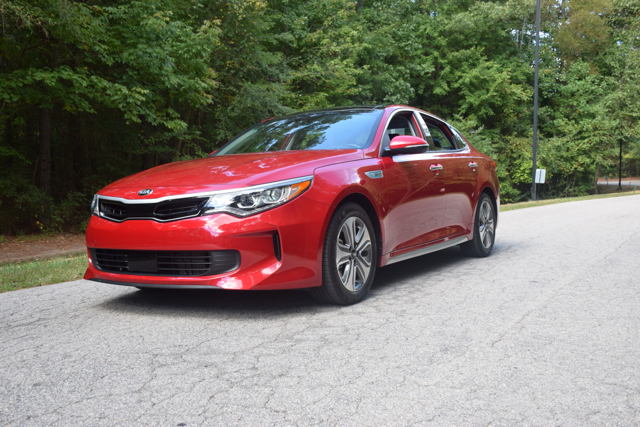 The 2.0-liter four-cylinder engine powering the Optima Hybrid is about as mild as they come with just 154 horsepower under its belt. Thus, this model makes an EPA-estimated 39 mpg in the city and 46 mpg on the highway. Notably, we averaged about 40 mpg and that’s a fantastic number for two people and a trunk full of gear. The engine joins with an electric motor to send power to the front wheels. At times, the motor delivers its own power alone (typically while crawling), but also joins with the engine to combine for 192 horsepower and 271 pound-feet of torque. Consequently, this means when you need to “floor it” the hybrid responds in kind by delivering copious amounts of power. 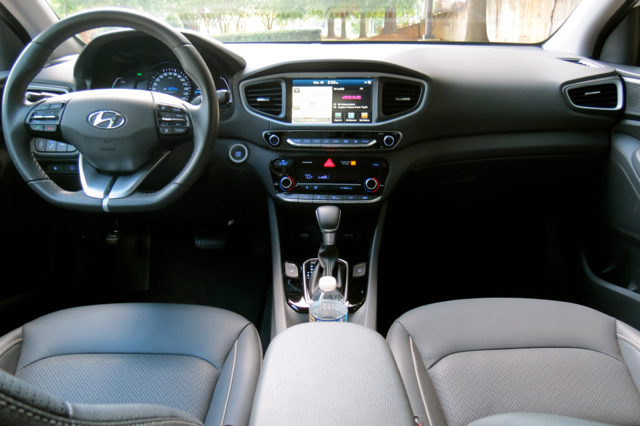 Furthermore, you’ll enjoy a comfortable ride and light-to-the-touch steering in a sedan offering a premium feel. Yes, the brakes are squishy when first applied, but I soon became comfortable with the sensation — what creates kinetic energy that’s sent to the lithium polymer battery pack for distribution later. Optima Hybrid prices can climb quickly if you opt for the EX with the technology package. Personally, I like the base model with the available Hybrid Convenience Package, what delivers a well-equipped hybrid for $29,000. Work hard on extracting your full incentives and your out-the-door price should come in around $25,000. That’s excellent for any midsize sedan, yet especially so for one topping 40 mpg. As for owning a hybrid in the first place, if you plan to keep it for the long haul, you stand a much better chance of getting your money’s worth. You also have Kia’s excellent warranty plan backing your Optima Hybrid, providing yet another compelling reason to go green. Finally, as for the Optima Hybrid’s competitive set, you’ll find the Toyota Camry Hybrid, Ford Fusion Hybrid, Hyundai Sonata Hybrid, and the Chevrolet Malibu Hybrid offered. Hyundai’s Ioniq line of electrified vehicles is here. The Prius has long been synonymous with “hybrid” ever since Toyota launched this model two decades ago. Since then, various manufacturers have attempted to replicate Toyota’s success, but nearly every new model has failed to make a dent in Toyota’s dominance. But that hasn’t stopped Hyundai from launching its own line of electrified vehicles. Moreover, its all-new family of Ioniq models goes one step further than Toyota does with the Prius — it includes a full-electric model as well as standard and plug-in hybrid electric vehicles. The front-wheel drive Ioniq trio are in the midst of a months long roll out with the standard hybrid arriving first followed by the EV (California only). This fall, the PHEV version debuts, supplying a happy medium between the two earlier models. 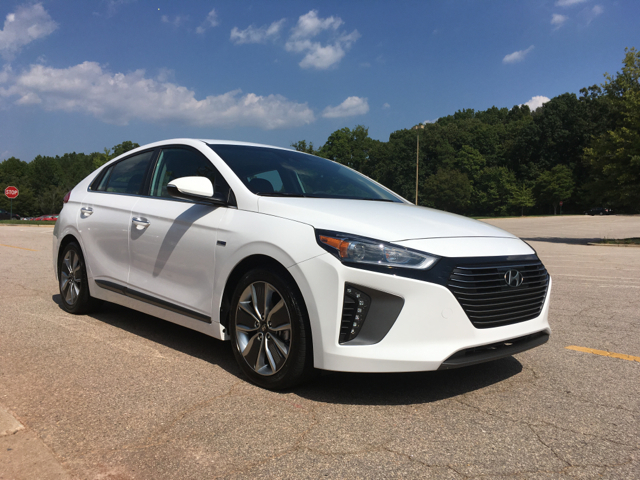 Recently, a 2017 Hyundai Ioniq Hybrid passed through my press fleet rotation. This wasn’t the first time I drove one, but my full week with it afforded me with the opportunity to spend much more time with one than I was able to do this past February during an all-too-brief media event. Hyundai offers the Ioniq in three trims: Blue ($22,200), SEL ($23,950), and Limited ($27,500). Add $835 for destination. 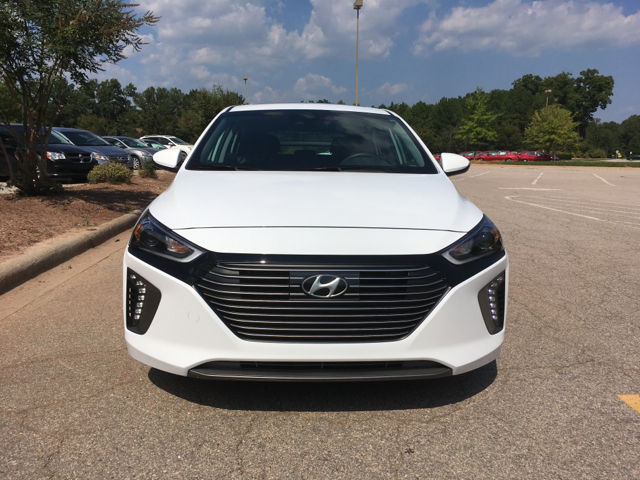 My test model was an Ioniq Limited, which added a $3,000 Ultimate Package. The Ultimate package brings in such safety items as automatic headlamps with dynamic bending technology, rear parking sensors, and automatic emergency braking with smart cruise control. The latter two combine to not just keep a safe distance between the Ioniq and the car immediately in front, but stop this vehicle if you don’t take action quickly. The remaining items in this package include navigation, an 8-speaker Infinity audio system, a wireless device charger, cargo cover, and a Blue Link guidance package. 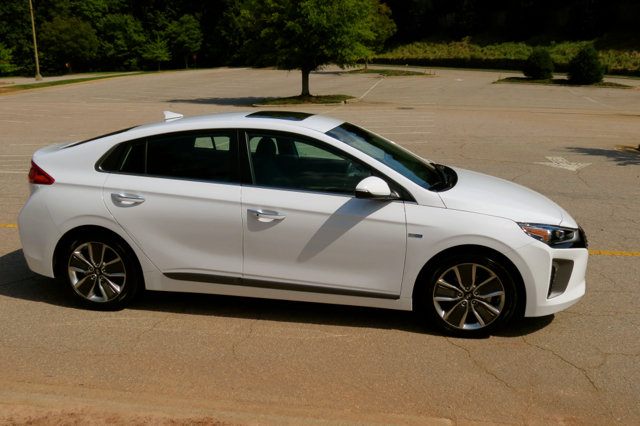 Take a quick look at the Ioniq and you may see the Elantra. This isn’t a mistake — Hyundai built its fleet of electrified cars on the Elantra’s platform. But there are some differences evident, particularly the tapered rear end that forms the Ioniq’s hatchback. From a three-quarter view, it appears unfinished or at least it seems like a cross between a trunk and a hatch. Hyundai’s broad grille is evident — wider at the top and narrower at the bottom. The headlights flow out from the top; at the bottom corner are pronounced pockets for the available fog lamps. Front to back you’ll find clean lines, sculpting and on some models trim embellishments. The Ioniq certainly doesn’t employ the controversial styling cues of the Prius, but it does share its split rear window look. 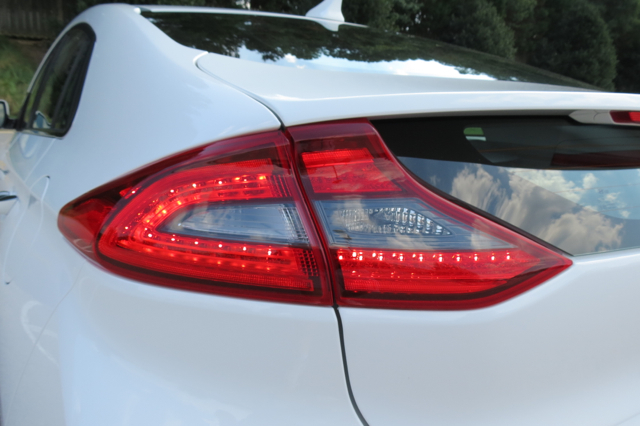 My test model also featured wraparound LED tail lamps along with diffuser-like trim. All Ioniq models come with active grille shutters for improved fuel efficiency, a rear spoiler, and dual manual-folding body color power side mirrors. 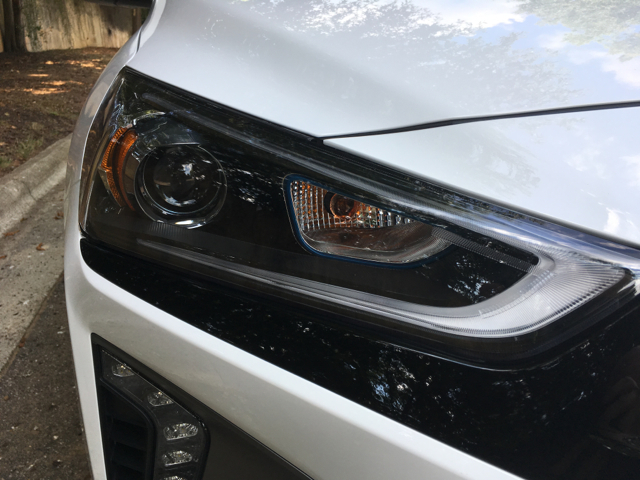 You’ll also find projector headlights with daytime running lights, automatic headlights, and even has door handle approach lights — the same as you’ll find in far more expensive models. Additional features found on the other trims include heated side mirrors, chrome trim, HID headlights, and LED taillights. The previously mentioned Ultimate Package for the Limited trim also brings in dynamic bending light technology — I tried it and it works very well: hit any corner and the lights tilt slightly as you turn your wheel before correcting. With it, you’ll enjoy a wider angle view on dark roads, which means you’ll also pick up eye shine sooner and hopefully avoid hitting a deer. 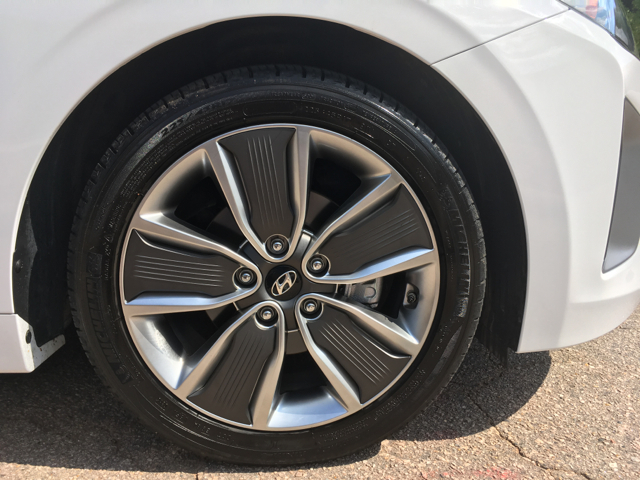 Most models are outfitted with what Hyundai calls 15-inch Eco-spoke wheels. On the Limited, the wheels measure 17 inches. Yes, you can fit five people in the Ioniq. 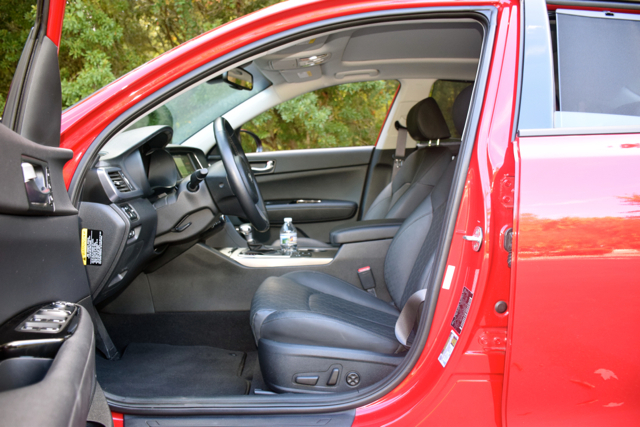 Hyundai models are typically very roomy and often measure at the top of each respective segment’s passenger volume limit. 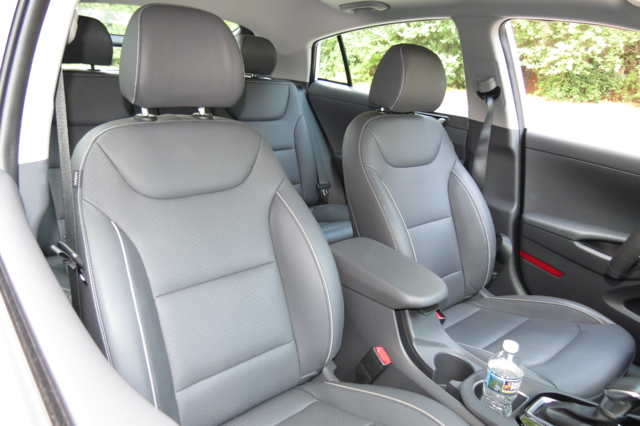 You’ll find comfortable bucket seats up front and a 60-40 split fold-down bench seat in the second row. 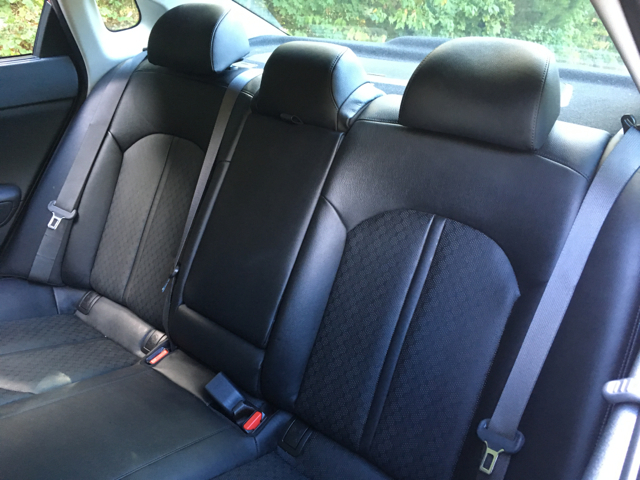 Definitely, the rear seat is best for two, but you can fit three in a pinch. The focal point of the this model is the instrument panel, which includes hybrid gauges to help you enhance fuel economy. Truthfully, I looked at the gauges a lot, especially when I wanted to reach my next mpg threshold. I’m a fan of Hyundai’s center stack/console. The layout is clean and the bottom part of the stack features a large open area to hold your smartphone with the USB port conveniently placed nearby. The under-the-armrest storage area is deep and includes a removable tray. 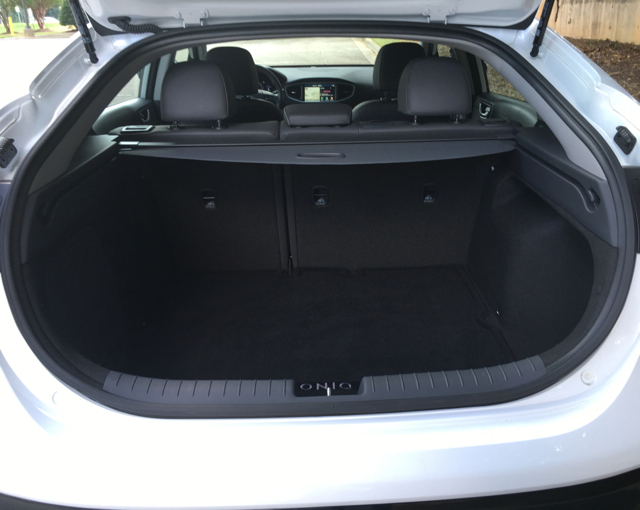 There are lots of other storage areas in the Ioniq too, including in the doors. Standard equipment includes keyless entry with push-button ignition, full power accessories, a tilt-and-telescopic steering column, steering wheel-mounted controls, air conditioning, manually operated front seats, and cloth seats. Upgrades include a power driver’s seat, leather-covered seats, heated front seats, a leather-wrapped steering wheel and shift knob, an automatic dimming rearview mirror, and LED interior illumination. A cargo cover, floor-mounted rear vents, and a driver seat memory system is included with the Limited’s Ultimate package. You won’t find safety ratings yet from the Insurance Institute for Highway Safety (IIHS) nor from the National Highway Traffic Safety Administration (NHTSA). We expect some sort of crash testing to be conducted in the near future and likely on the hybrid model. That said, we’re confident the Ioniq delivers on all the important crashworthiness categories given that the very similar 2017 Elantra pulled down a Top Safety Pick+ rating, the Institute’s highest score. Tech and Hyundai go hand in hand. Yes, the same can be said about other manufacturers, but when it comes to Hyundai products, they seem to always go a step further. The 2017 Ioniq reflects that care. 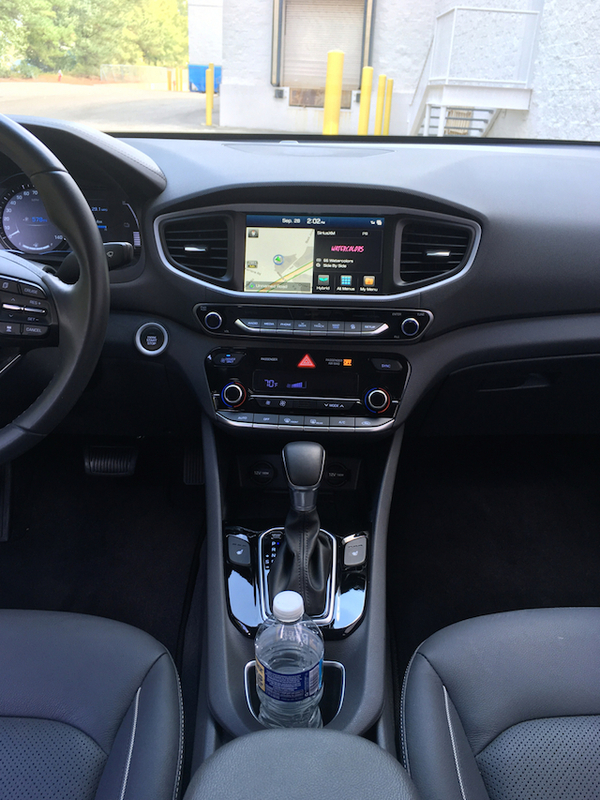 Standard equipment includes an audio package with HD Radio, satellite radio, Bluetooth connectivity, USB and auxiliary input jacks, and a 7-inch color display. You’ll also find Android Auto and Apple CarPlay smartphone compatibility. Optional equipment brings in an 8-speaker Infinity audio system, an 8-inch color display with navigation, Blue Link telematics, and a wireless phone charging pad at the base of the center console. 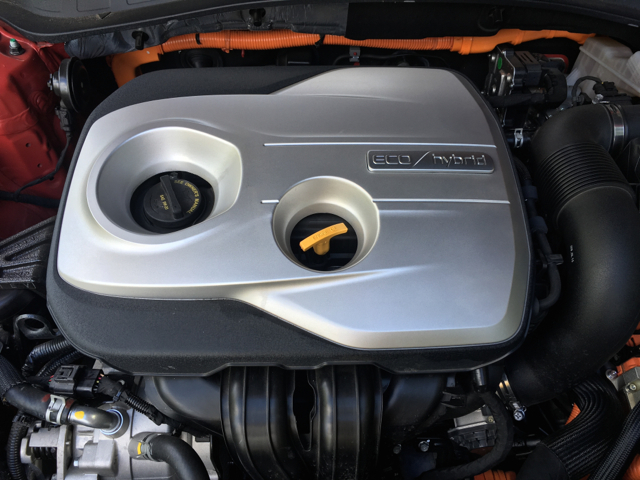 Hyundai’s first try at a hybrid employs a familiar engine: the 1.6-liter four-cylinder powerplant found in such models as the Accent and Elantra. But there is a difference here as this version runs on the efficient Atkinson cycle and features a long stroke and optimized cooling. You’ll also find a permanent magnet electric motor and a dual-clutch six-speed automatic transmission optimized for the engine and electric motor. Electric power is stored in a lithium-ion polymer battery. By itself, the gas engine might be too weak for this model. Fortunately, when you need to floor it, the Ioniq responds in kind, pushing 139 total system horsepower. 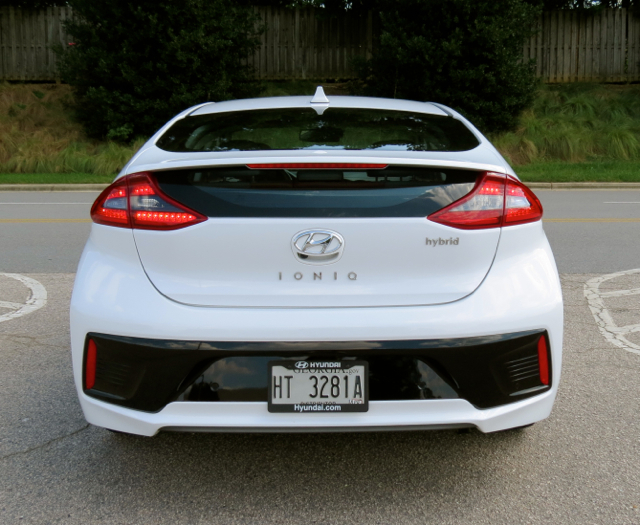 Also aiding and abetting in all this is the Ioniq’s relatively lightweight frame — nearly 3,000 pounds. The 2017 Ioniq hybrids does what it needs to do — deliver top fuel economy. Steering is light to the touch, handling is surprisingly agile thanks to the multi-line rear suspension, and braking feels like it does in most any other hybrid — squishy at the outset before firmly bringing this hatchback to a stop. Should you tire of the default eco mode, you can switch to sport mode to maximize performance. Of course, in doing so fuel economy suffers. Because you have gauges to guide you, it isn’t too hard to optimize your fuel economy. I averaged 50.6 mpg over one segment compared to the 54 mpg posted. Although I came up short, temperatures were above average for the week I had this model. Thus, unless you’re driving during optimum ambient conditions — somewhere around 72 degrees — you’re likely to come up short. Still, 50.6 mpg is amazing. Although I’m not recommending the base model, the Blue’s $23,085 base price point puts a high-mileage hybrid in the price range of more consumers. Sure, you could opt for a similarly equipped Elantra and pay thousands less, but with the potential for fuel economy in the high 50s mpg, you’re looking at a compelling reason to go green. Still, I typically recommend shoppers look one grade above the base model to get at least some of the amenities they want. For just $1,750 more than the Blue, the SEL adds heated front seats, leather touches, a more detailed instrument cluster, improved exterior trim, along with blind spot detection with rear-cross traffic alert and lane change assist. Some buyers may want to hold off and wait for the PHEV Ioniq to appear as it’ll provide even better fuel economy. Importantly, most consumers should qualify for a federal tax credit, which should offset some of the premium cost of the plug-in model. A tax credit is available with the electric Ioniq too, but not with the standard hybrid. Click on photos to enlarge. Photos copyright Auto Trends Magazine. All rights reserved.